I honestly don't know why we still have this wall clock. It has been broken for literally a month now. Maybe more. Yet, for some strange reason- it's still up on the wall- tempting and tantalizing us all with it's "click click click click"...Yeah it counts the seconds all right, it's little hand goes around with each second-induced-click- but the time will NOT stay (or move sometimes for that matter). Sneaky little guy. He (she? it?) almost made my husband late to work one morning! Clicking and counting seconds and pretending like it's time is correct. Only to be hours and hours slow! We changed the batteries, we messed with it's...face? It held the time perfectly ...for a little while- and then stopped altogether....again. Yet, like I said earlier- it's STILL up on the wall. Who's the winner in that round? I want it to work. Seriously. It's the first wall clock my husband and I bought for "our home" 4 years ago. I'd be so sad to see it go. There's nothing really special about it- it's round, silver, basic- from Target....yet I kind of love the thing. It's been a good clock. Until now. The spot it has perched on for so long is very much "it's". Any who, every time I go to "do the deed" I get sad for it. Like those old Disney cartoons where inanimate objects actually have feelings and such. You know, like this little house? And that toaster? GAW! Don't even get me started. I can't even watch the little house cartoon without bawling. Sheesh. So basically because I'm the sappiest person on Earth, I continue to take the clock down, fidget with it's knobs, relocate the hands to the proper time, place back up on the wall- and give it another chance at clock-life....and another...and another...and another. All because it's still clicking and it's little second hand is still going around and around. It's trying it's best. Waaaaaaaaaaaaaaaaah! Yet strangely enough, things that were once very much alive (like this acorn squash)- I have little feelings for. Scratch that...now that I think of it- totally not true. I guess I choose not to give thought to such things. I'd never eat! To be honest, as I'm typing I'm actually picturing that darn squash...in it's environment...doing squash things...enjoying it's squash life...probably hanging out with it's squash family and stuff... Until that horrid day when it was snatched up..never to be seen again. And then here I come- butchering the heck out of it and throwing it in a burning hot oven. 1. Preheat oven to 375*F and line two sheet pans with parchment paper. Set aside. 2. 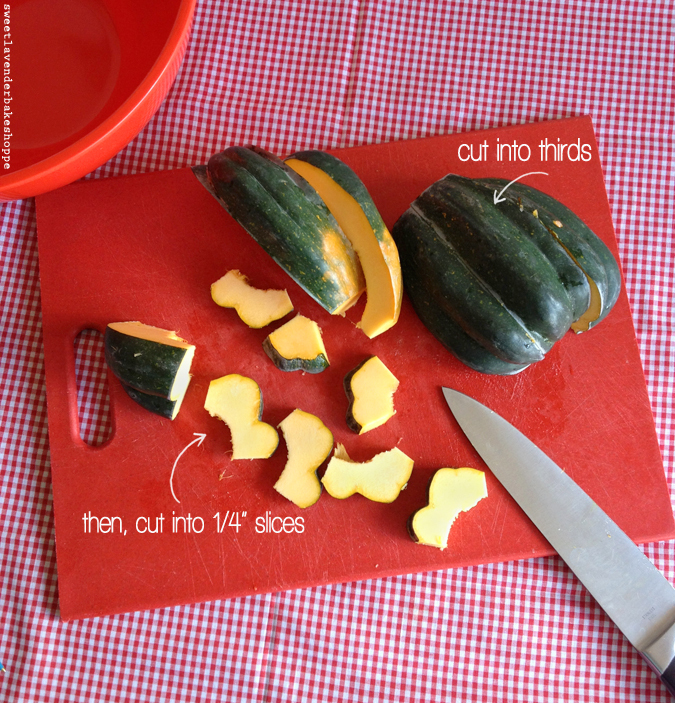 Wash and dry outside of your acorn squash. For this recipe we will be eating skin and flesh! 3. 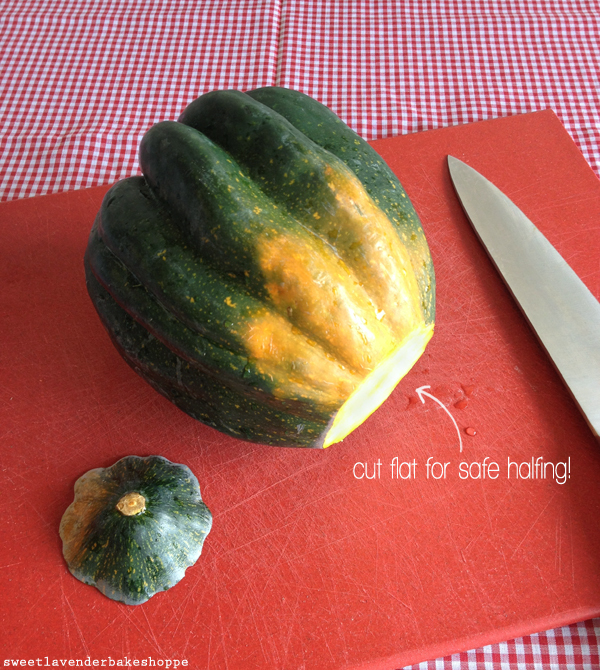 With a large knife, carefully cut bottom and top off squash. This will allow for a much more stable squash when we cut in half. 4. Stand flat on bottom cut you just made and carefully slice in half. 5. Clean out seeds. I used my nifty grapefruit spoon for this- worked like a charm! 6. Cut each half into thirds. Then cut each third into 1/4" slices. Add all your pieces to a large bowl. 7. 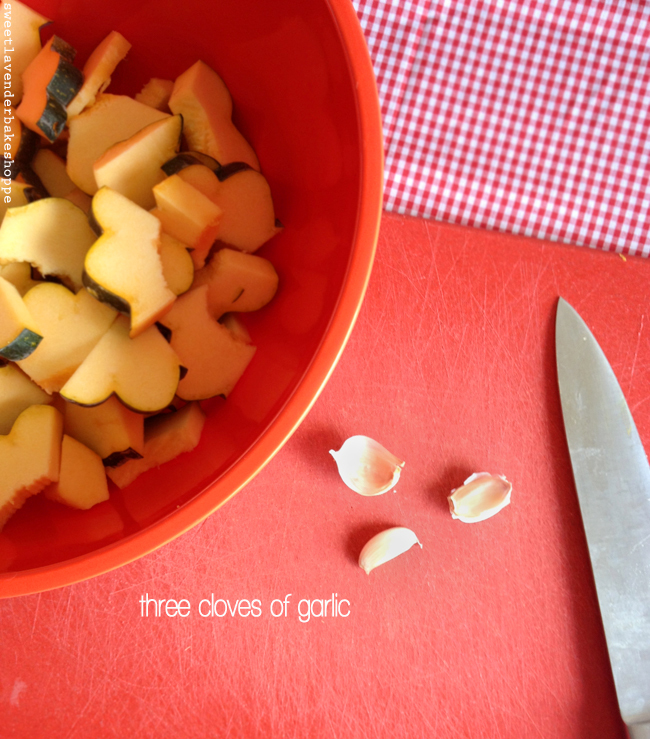 Peel and mince three garlic cloves very finely. Add to bowl. 8. 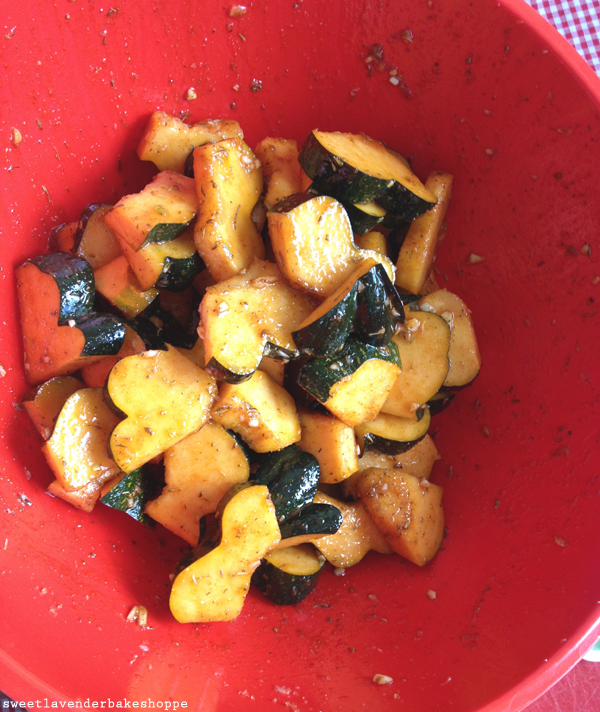 Next, add your olive oil, brown sugar, garlic powder, smoked paprika, cayenne, sage, thyme, and salt to your bowl. Toss to coat well. 9. 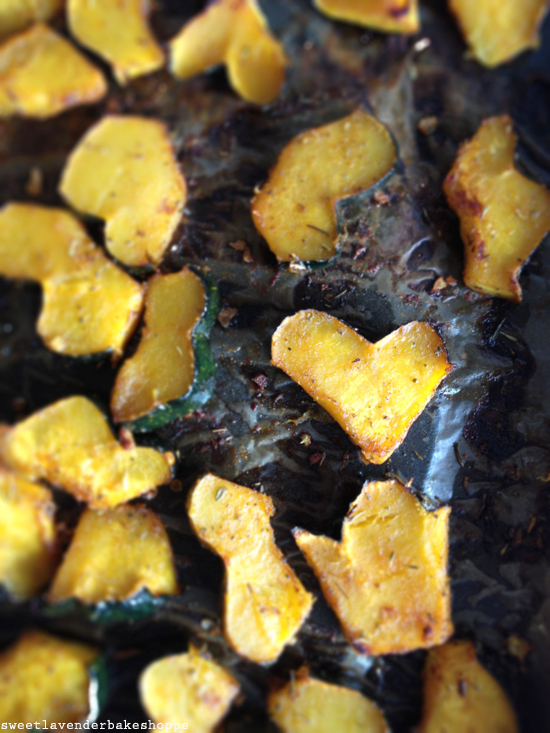 Spread evenly into a single layer on to your parchment lined baking sheets. 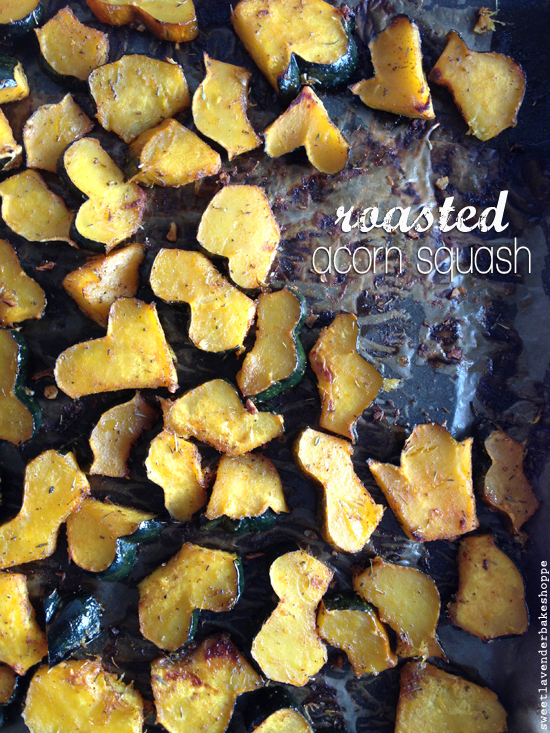 You definitely want the whole surface of each squash slice to touch the bottom of the pan- it will help it turn golden and delicious. 10. Bake 18-20 minutes, turning pans 1/2 way through. 11. 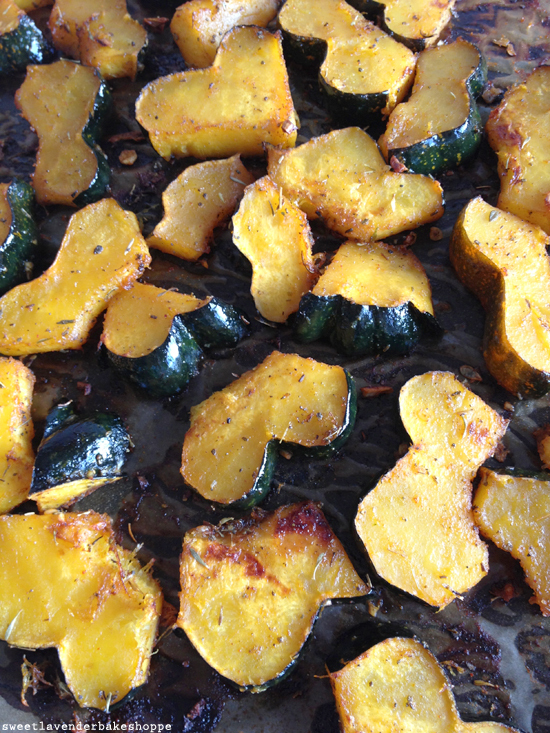 Take out of oven, flip squash slices over and add back to oven. 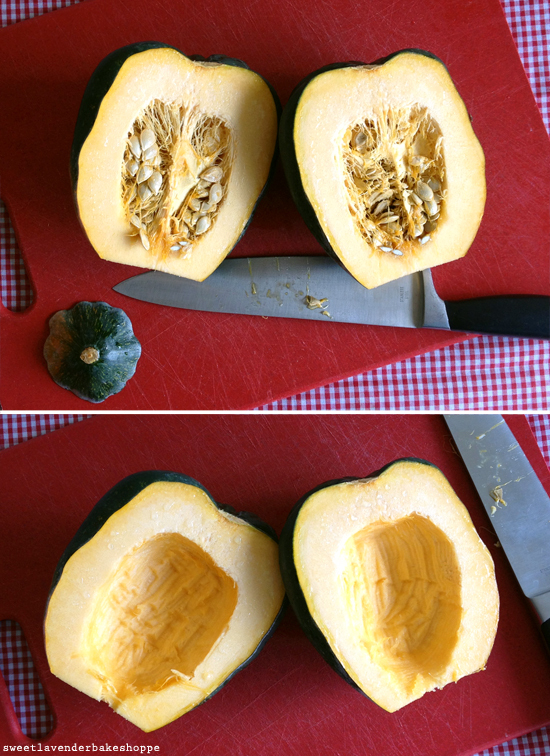 Bake an additional 15 minutes or until your squash is cooked through, skin is soft, and it's meat is a nice golden brown. Serve warm.